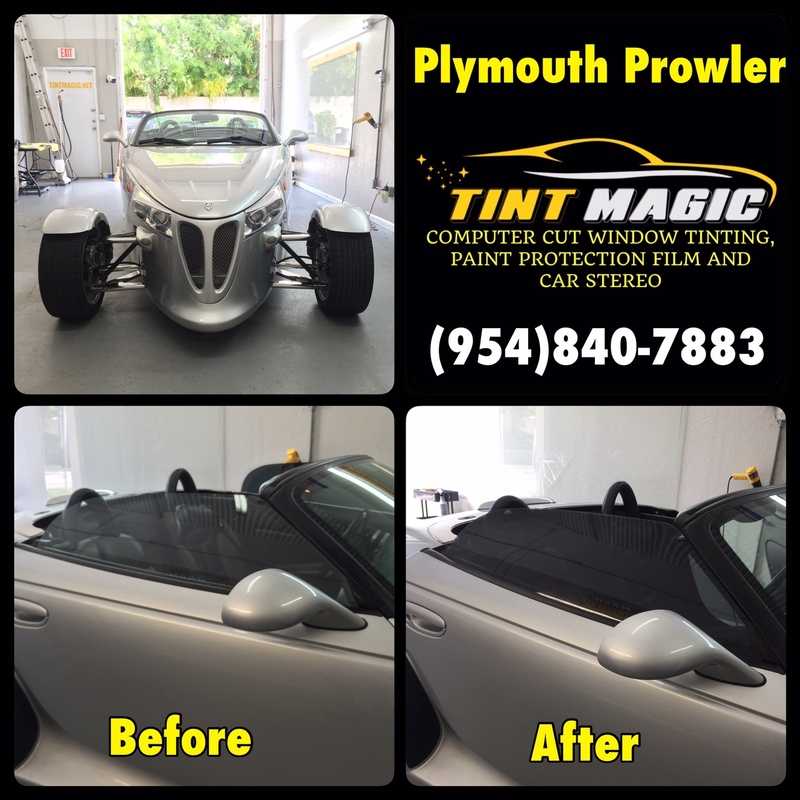 Plymouth Prowler at TintMagic Window Tinting serving Parkland, Coral Springs, Coconut Creek, Tamarac, Deerfield Beach, Pompano Beach, Sunrise, Lauderhill, Margate, Weston. We are located at 11344 Wiles Road Coral Springs, Fl 33076. Call us for a free estimate! (954)840-7883. The Prowler’s is a taut, tight piece, complete with a glass backlight and electric defroster. To lower this manual lid, you first unfasten two windshield-header latches, then pull a lever that releases a pair of locating pins embedded in the trunklid. Next, you flop the backlight forward, then you punch a yellow button that allows the trunk to open. The whole top falls into a flat, neat heap back there. It sounds complex, but the entire process cost us about 35 seconds, and because the top is completely hidden in the trunk, no tonneau is required. Our single complaint: We wish the top had some sort of headliner to hide its ugly steel reinforcing braces. The trunk, by the way, opens front to rear and is about five inches deep—useful only for one, maybe two garment bags laid flat.